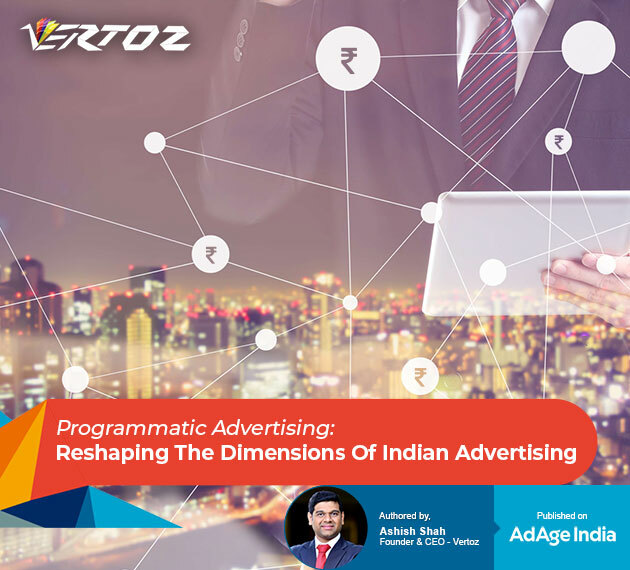 Ashish Shah, founder and CEO of Vertoz Advertising Ltd., explains the growing significance of programmatic advertising in the world of digital advertising. Programmatic Advertising with the use of its algorithms automates and streamlines the buying and selling of digital inventory and also eliminates human intervention up to a great extent. The cutting-edge technologies like AI (Artificial Intelligence) and ML (Machine Learning)smartly decipher the data patterns and thereby help marketers to enhance their advertising strategies. Programmatic is transforming the complete world of digital advertising and is steadily getting global. As per eMarketer, the programmatic ad spends in the USA were estimated to be around $33billion last year, and are projected to reach $46 billion in 2019. Digital Advertising is evolving with the on-set of Programmatic advertising, with the Indian government endorsing the idea of Digital India to businesses. Also, with a rise in other factors like increasing smartphone penetration and the availability of high-speed internet services at affordable prices, and everyone going digital, it seems like the perfect time for Indian businesses to shift their budgets to programmatic advertising. Currently, in spite of being at the nascent stage in the Indian markets, programmatic accounts for nearly 20% of the ad budgets by marketers. This number will only keep rising as more marketers come to know of the benefits of programmatic advertising. Out of the many advantages rendered by programmatic, it’s precise targeting capabilities attracts the maximum population of marketers. The variety of targeting options include demographic targeting, geographic targeting, behavioural targeting, psychographic targeting, targeting on the basis of O.S and O.S versions, browser and browser versions, device and device ID and more such options. The DMP (Data Management Platform) processes and analyses this data thus helping advertisers in understanding their potential customers. Numerous dating apps are now paving their way into the Indian markets, and would immensely benefit from the unique targeting capabilities programmatic provides. It can be the perfect choice while exploring markets as fragmented as India. Similarly, firms in the BSFI sector would prefer to target finance sites, as they are likely to find a more relevant audience there. The omnichannel targeting capabilities allow marketers to target their customers on multiple platforms at the same time. DCO (Dynamic Creative Optimization) helps in presenting personalized creatives based on the user’s run-time preferences. Programmatic advertising automates the whole process and thus eliminates human-induced errors on a large scale. It gives advertisers more flexibility, greater control over their creatives, and smart optimization capabilities that help them increase their ROI multifold. Programmatic is being accepted with open arms by many developed countries and is steadily being globalized. Including programmatic in your ad budgets is a smart choice to make, as it is here to stay and the future looks shining bright.